Bayless Junior High School prides itself on the respectful and productive behavior of students and staff. As a staff, we feel the need to continue working toward this goal by helping children learn necessary skills and behaviors for school success. To accomplish this, we implemented a school-wide program called the Positive Behavior System (PBS). The program is based on student responsibility in their choices as well as demonstrating traits from our Character Education and OLWEUS programs. These programs use a proactive educational approach, instructional strategies, and logical consequences. During the first two weeks of school, our teachers spend time discussing school and classroom procedures. We believe that taking this valuable time to allow all students to obtain the knowledge of our expectations, rewards, and consequences that each child will have an optimal learning experience for the entire school year. All students are expected to abide by certain standards of behavior in every area of the school, and under the supervision of every adult staff member, not just the classroom teacher. Each staff member has his or her own classroom expectations. 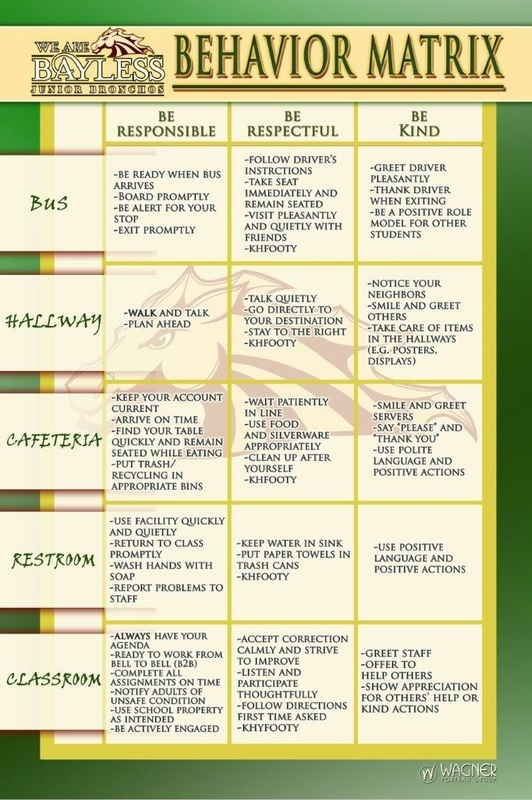 The “Bayless Junior High Way,” also known as Be(R²K), encompasses the traits we hope to see in every Junior Broncho: Be Respectful, Be Responsible, Be Kind. At Bayless Junior High, we take the high road. We take pride in our school. We use kind words and actions, listen thoughtfully, and stand up for ourselves and others. We show respect and take responsibility for our learning. We are Bayless Junior High! PBIS Tier 1: Universal School-Wide Expectations: Our school-wide expectations are posted in all areas of the school and are taught frequently throughout the school year. Teachers follow classroom vs. office managed behavior training to ensure fairness in behavior management. Teachers use the B(R2K) log for minor behavior infractions (classroom managed behavior) and Office Referral protocols in Infinite Campus for major behavior infractions (office managed behavior). The goal of PBIS is to provide students with knowledge of expectations and behavioral skills so they can act appropriately in all areas of the school. We come to school to learn. This is an excellent opportunity for students and parents to discuss the importance of respect, responsibility, and kindness, and how they help achieve academic success. PBIS Tier 2: Group Behavioral Interventions: Three times a year all teachers complete the Behavior and Emotional Screening System (BESS) on all students in their classroom. This data is analyzed and used to identify students who could benefit from additional behavioral support. Our research-based PBIS Tier 2 interventions include Check-In/Check-Out (CICO), Small Groups, Self-Monitoring and Tutoring. If your child is selected to take part in one of these group interventions you will be contacted by the school in order to obtain your consent, share specific details regarding the intervention, and explain your role in supporting your student to be successful. If you have any questions about these interventions or the BESS please contact the school counselor. PBIS Tier 3: Individual Behavior Intervention: Students who require intensive behavior intervention are selected for an individual screening process based off of data collected from behavioral and academic interventions. After this data is analyzed and it is determined that a student does require a more intensive behavioral intervention the Tier 3 PBIS team will complete a Functional Behavior Assessment (FBA) with student, teacher and parent input. If your child is selected to take part in a Functional Behavior Assessment you will be contacted by the school in order to obtain your consent, share specific details regarding the intervention, and explain your role in supporting your student to be successful. If you have any questions about this intervention or the FBA process, please contact the school counselor.